George the Fifth Bridge, New Approach Viaduct and Glasgow Bridge, Glasgow. 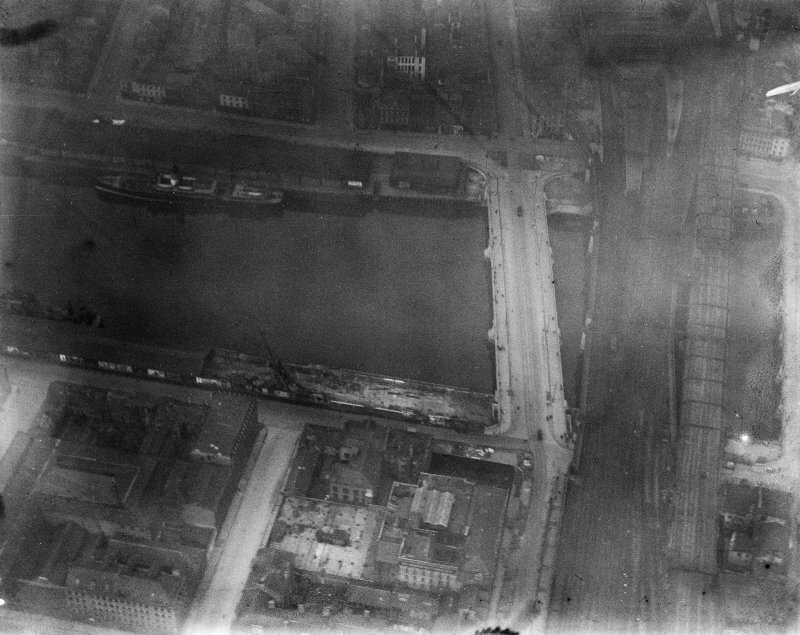 Oblique aerial photograph taken facing east. 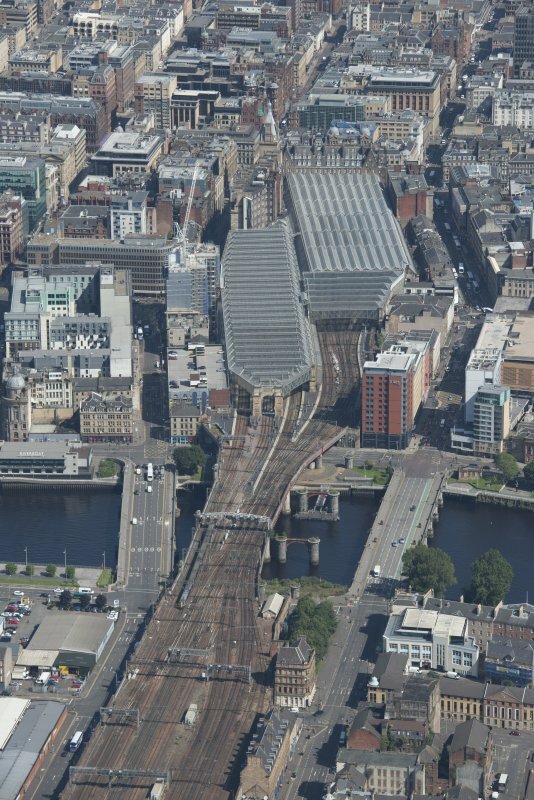 Glasgow, Glasgow Central Railway Bridge, oblique aerial view. 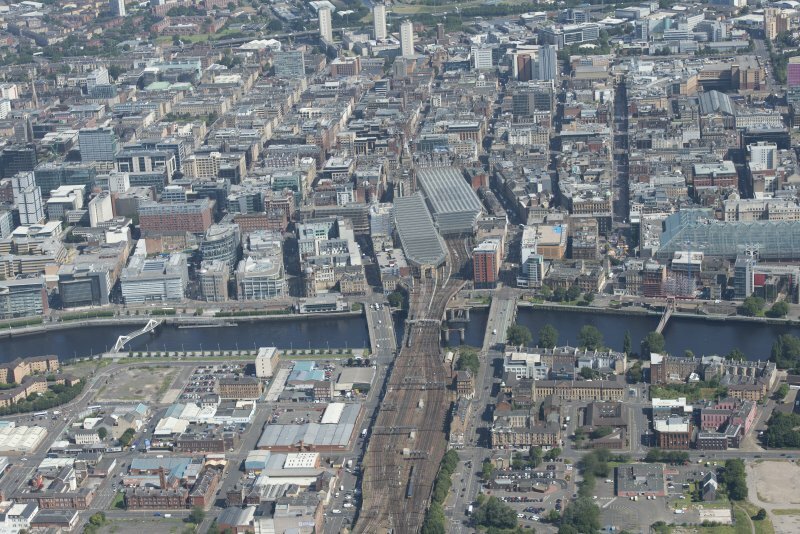 Glasgow, general view, showing Glasgow Bridge and Central Station. 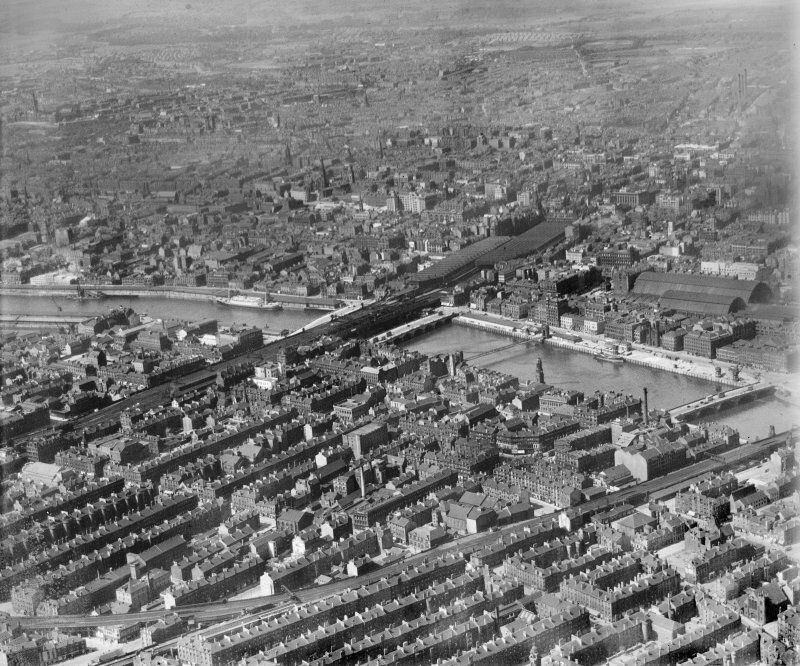 Oblique aerial photograph taken facing north. 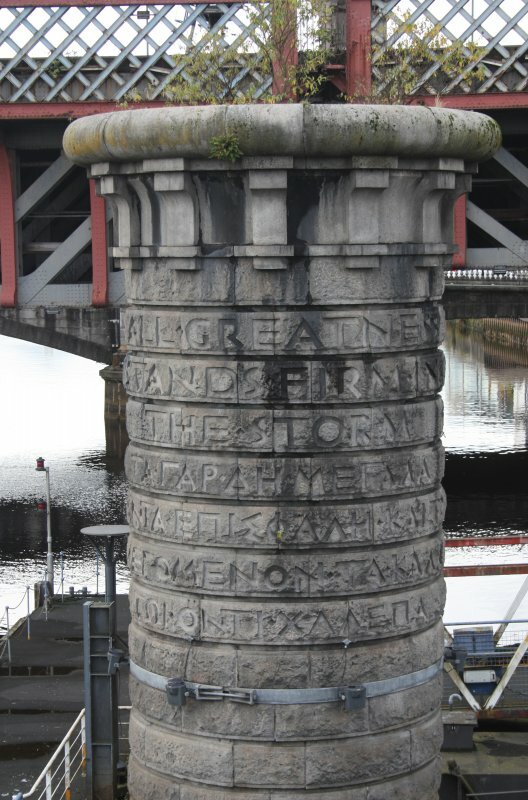 Detail of Ian Hamilton Finlay inscription on bridge pier. 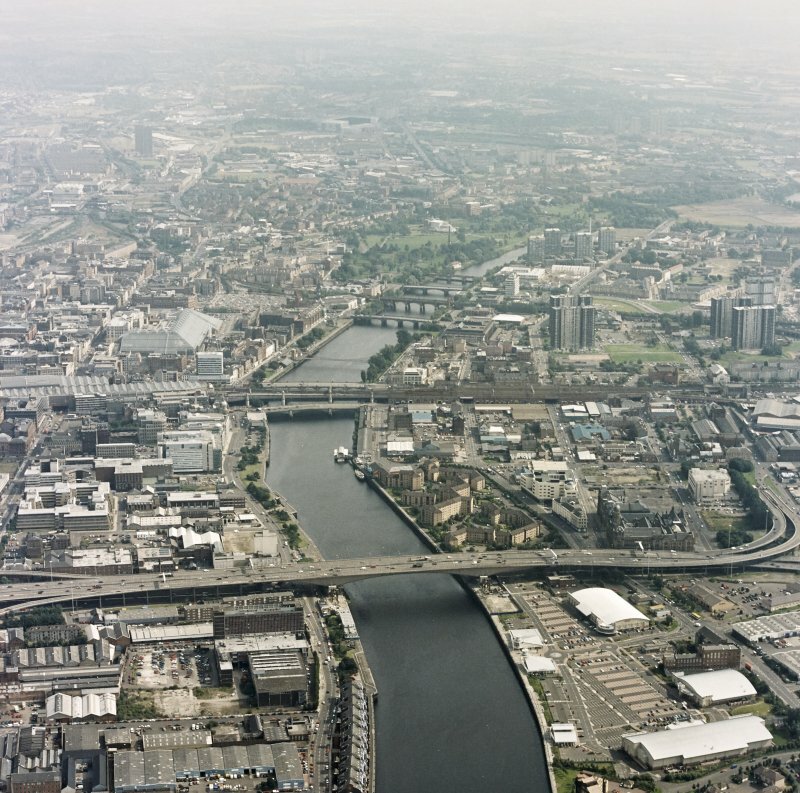 Glasgow, general view, showing George the Fifth Bridge and Clyde Street. 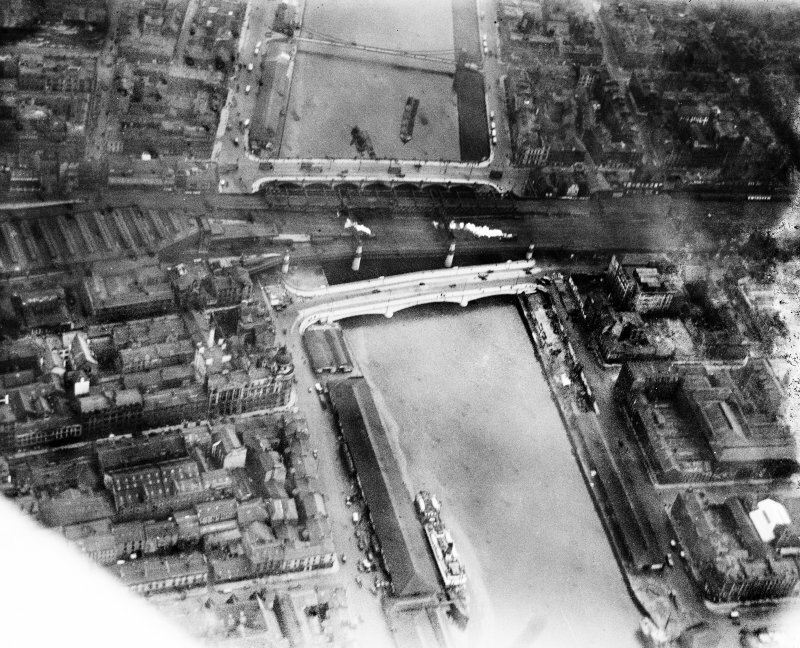 Oblique aerial photograph taken facing east. This image has been produced from a damaged negative. 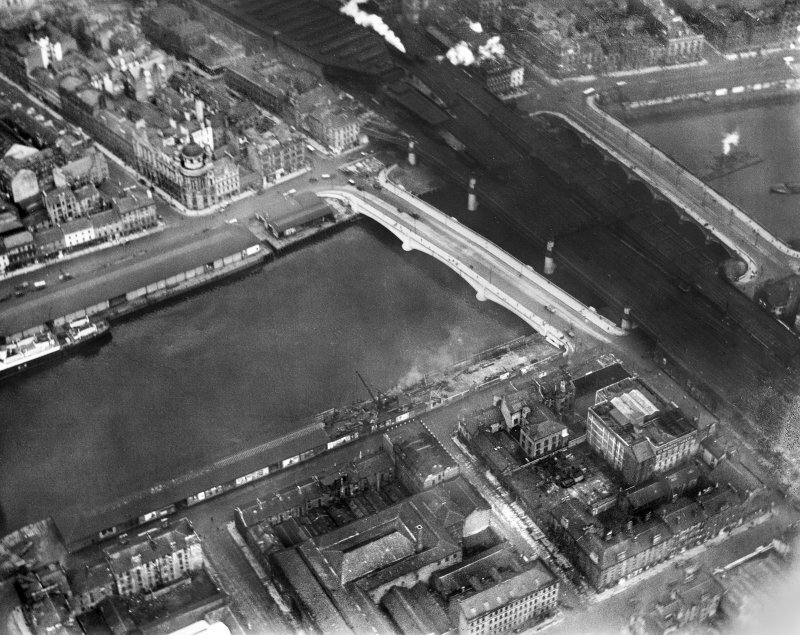 Oblique aerial view of the New Approach Viaduct, Glasgow Bridge, George The Fifth Bridge and Old Approach Viaduct, looking NW. 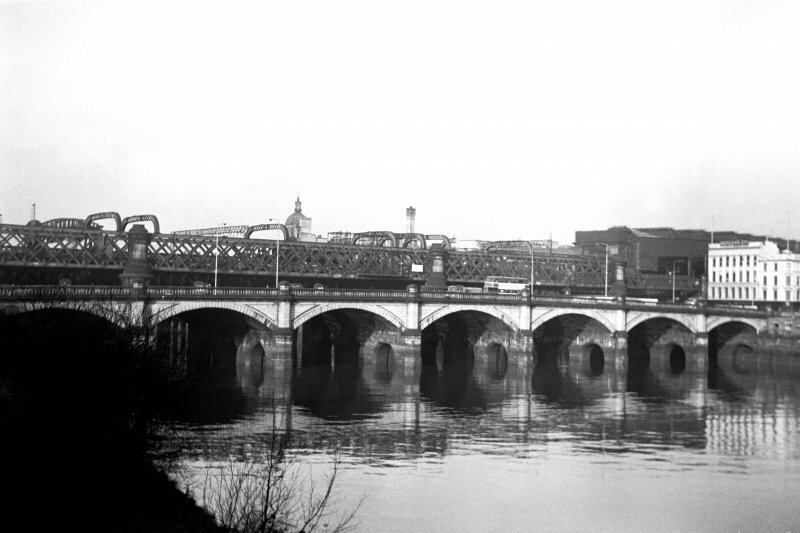 General view of inscribed bridge pier. 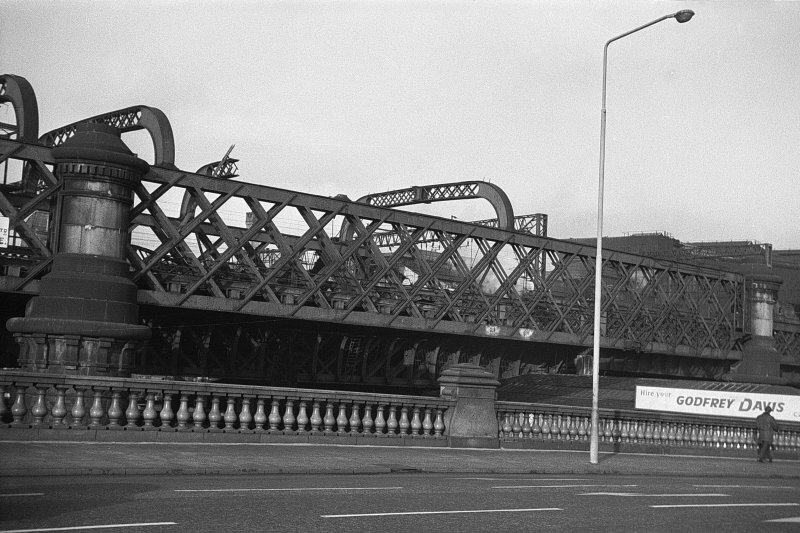 George the Fifth Bridge and New Approach Viaduct, Glasgow. 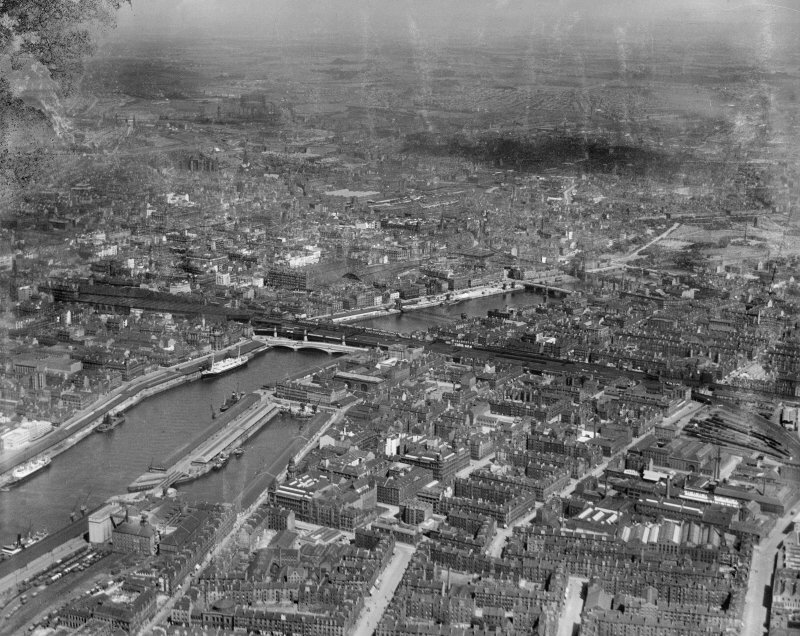 Oblique aerial photograph taken facing north. 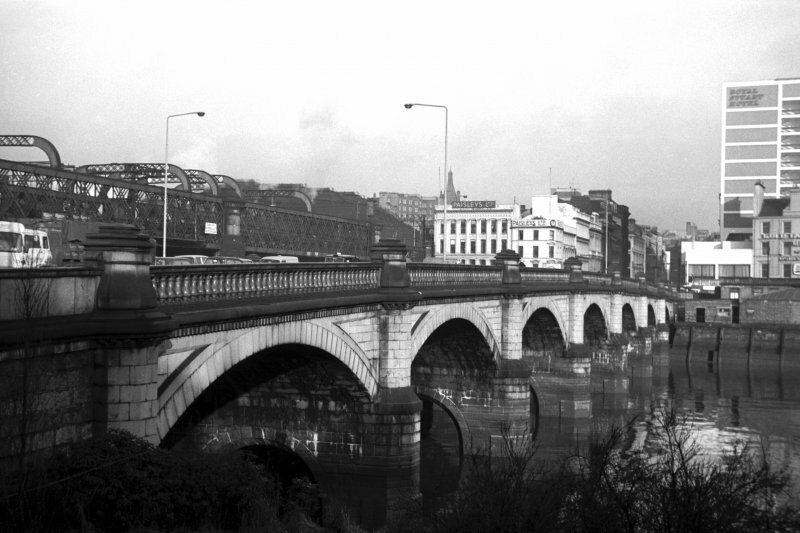 George the Fifth Bridge, New Approach Viaduct and Glasgow Bridge, Glasgow. 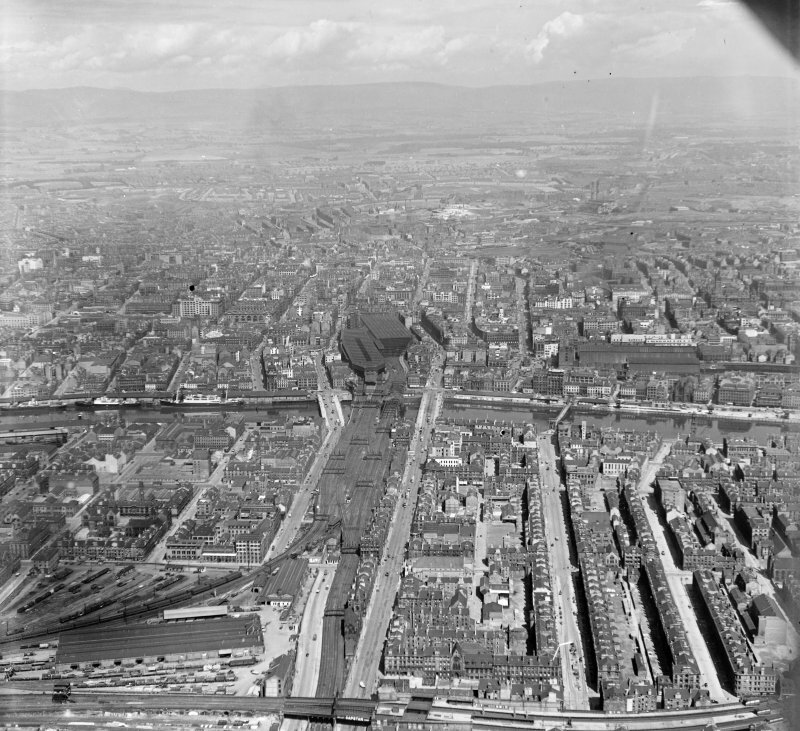 Oblique aerial photograph taken facing north-east. This image has been produced from a damaged negative. From South of river, looking North Glasgow, Lanarkshire, Scotland. 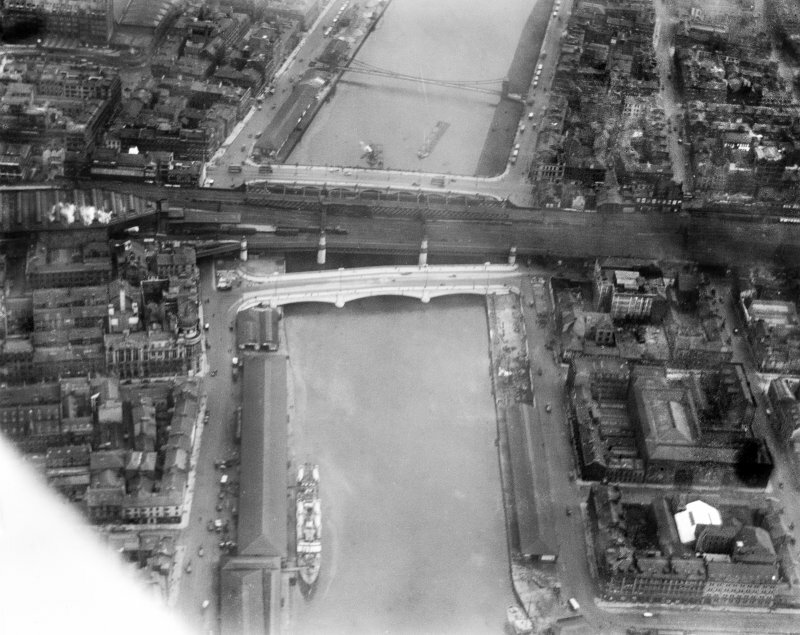 Oblique aerial photograph taken facing North. 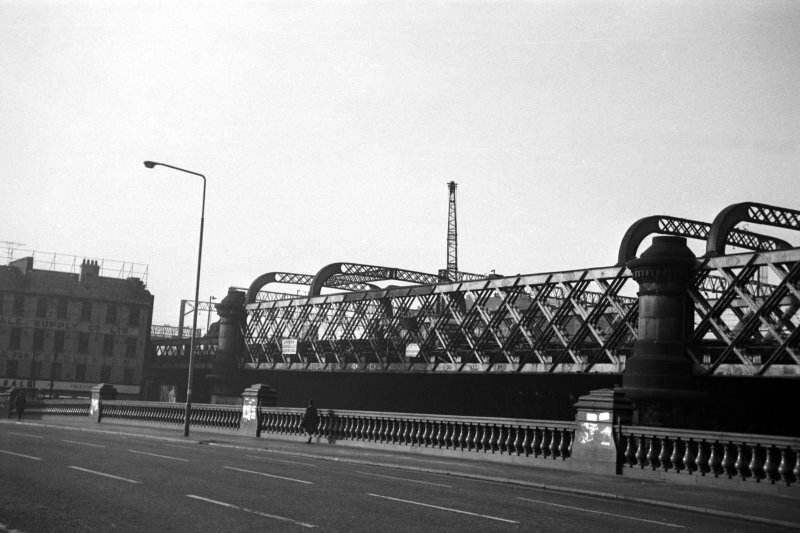 George the Fifth Bridge, New Approach Viaduct and Glasgow Bridge, Glasgow. Oblique aerial photograph taken facing east. This image has been produced from a damaged negative. View from south of graffiti on the southernmost pier (NS 58709 64715) of the old viaduct. 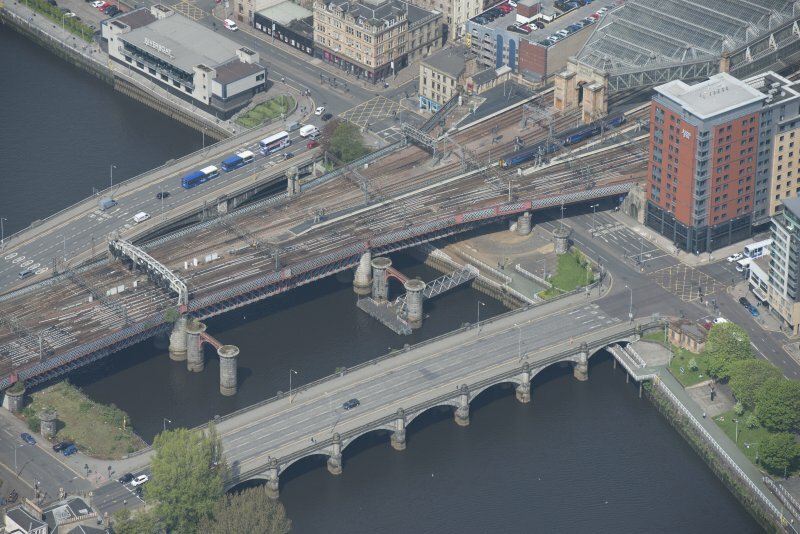 Glasgow, Kingston Bridge, oblique aerial view. Location formerly cited as NS 5870 6471 to 5873 6486. NS56SE 140.01 5871 6488 to 5867 6473 (new approach viaduct). For adjacent (to N) and associated Central Station, see NS56SE 77. 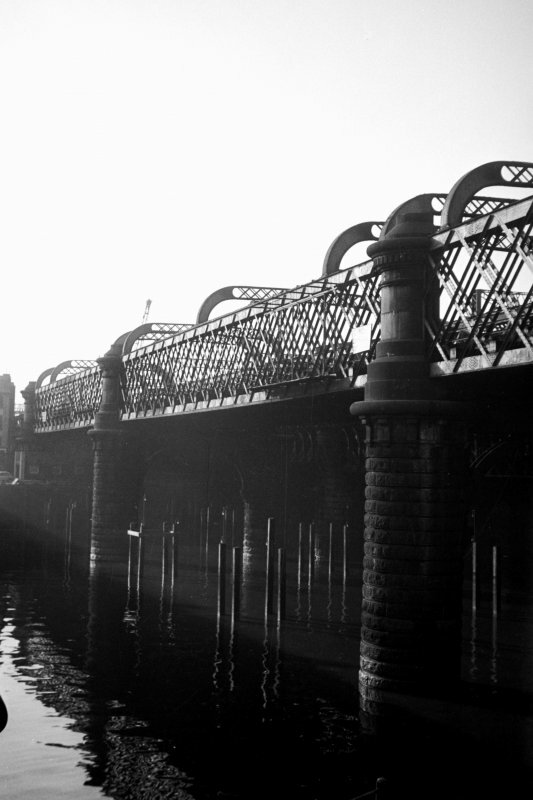 (Central Station Bridges). 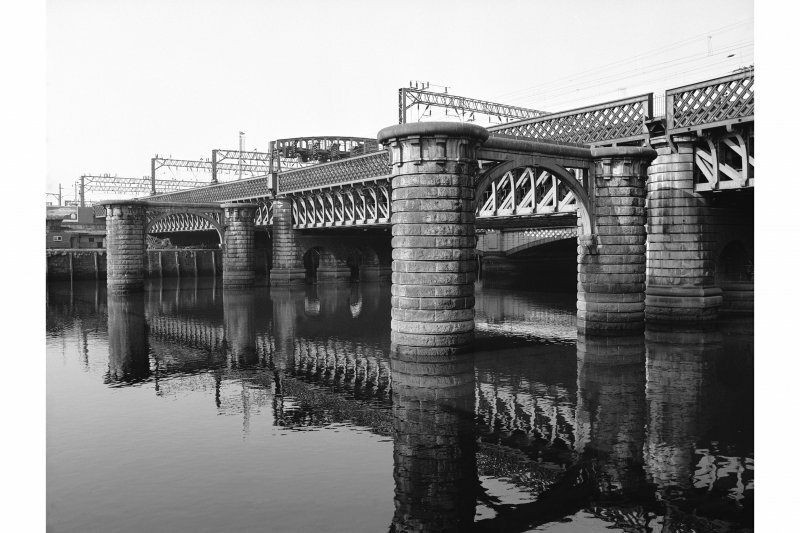 The first bridge was built 1876-8 for the Caledonian Railway, being designed by Blyth and Cunningham, engineers, and built by Sir William Arrol and Company. It was about 700ft (213.4m) long. 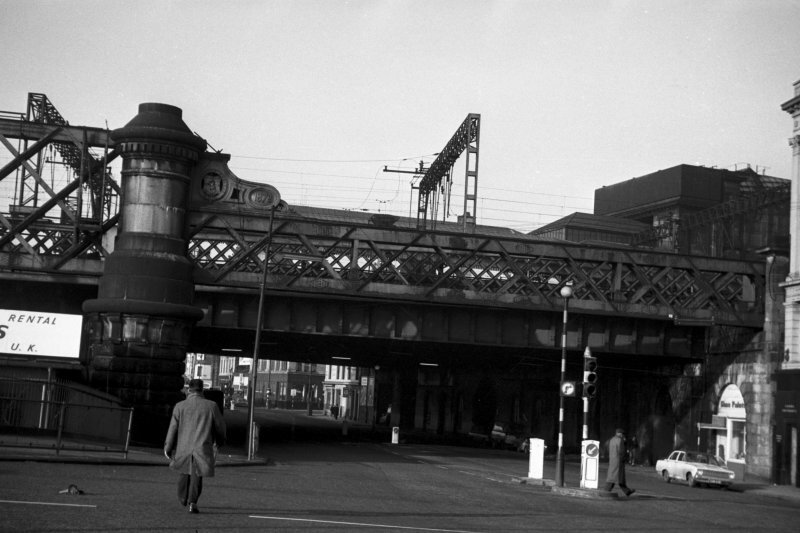 The approach spans, over Clyde Place [to the S] and the Broomielaw [to the N], were of plate and lattice girder construction, respectively 60ft [18.3m] andf 90ft [27.4m] long, while the main spans were 164ft [50m], 184ft [56.1m] and 152ft [46.3m] long. 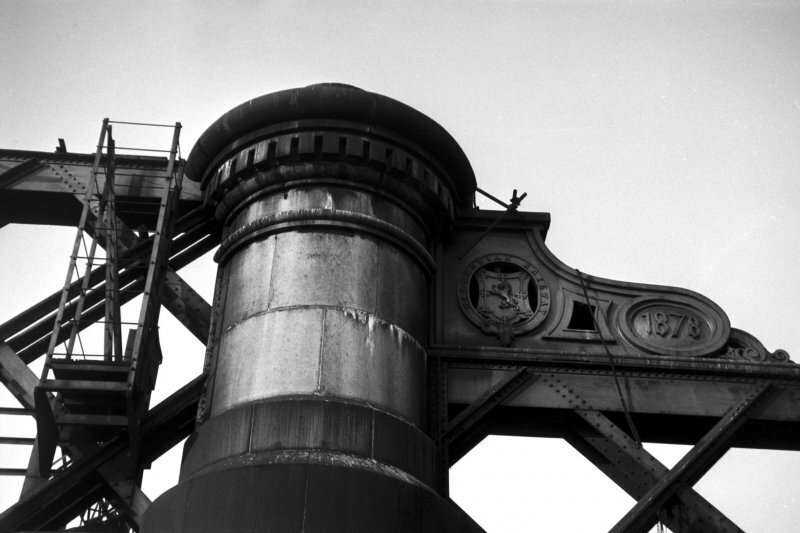 These latter were formed of wrought iron lattice girders with their top edges linked by light arched lattice girders. 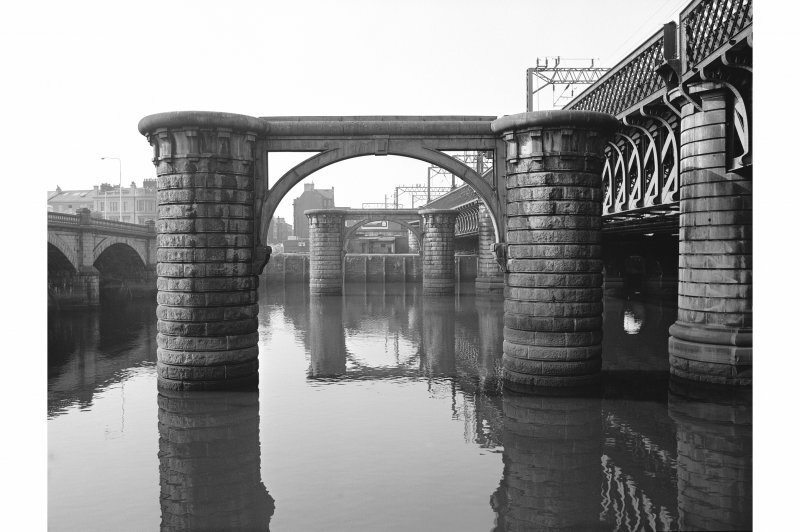 The girders were carried on twin masonry piers linked by cast-iron arches. 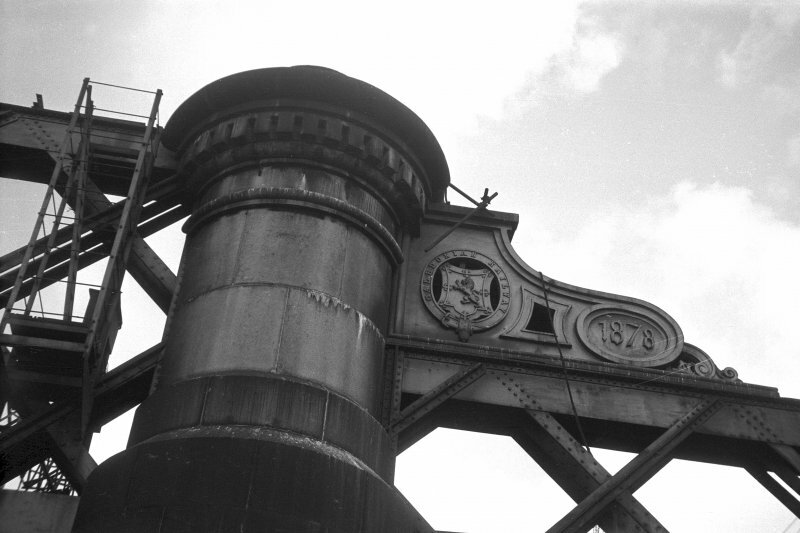 At each end of the bridge were cast-iron plaques with the Caledonian lion rampant encircled by a garter, with the date 1878. 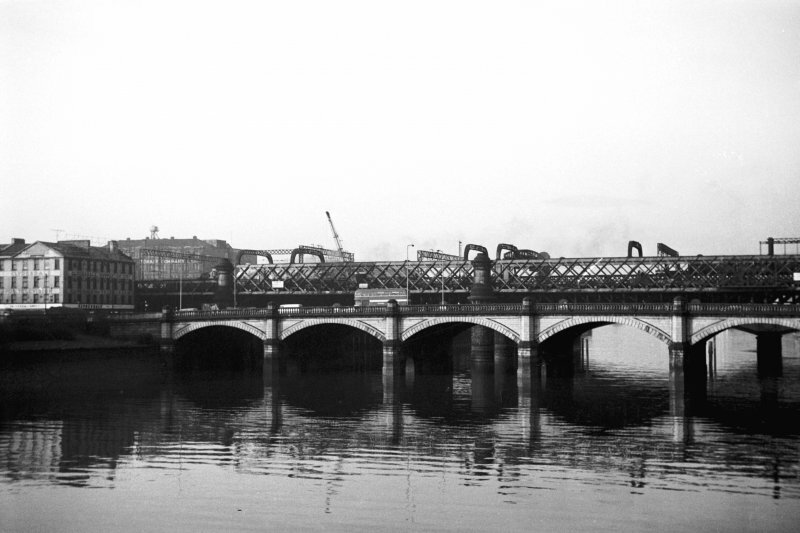 This bridge was demolished in 1966-7, only the granite piers and cast iron arches remaining. 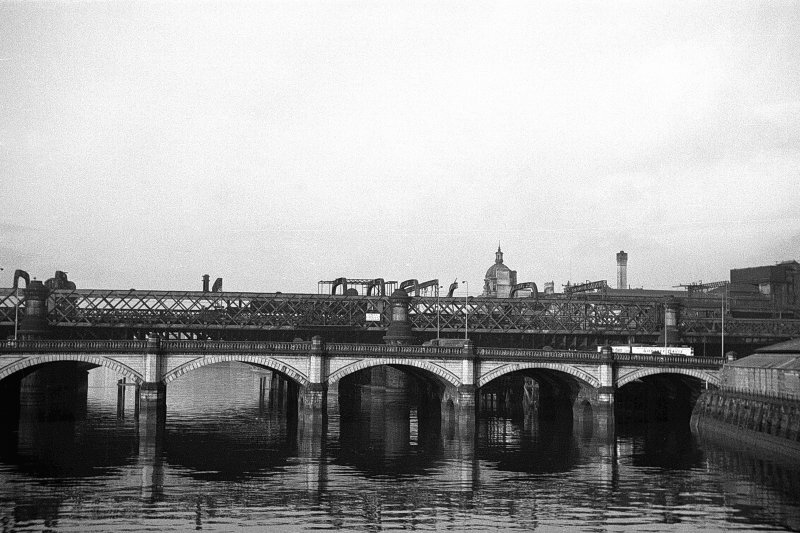 (Caledonian Railway Bridges). 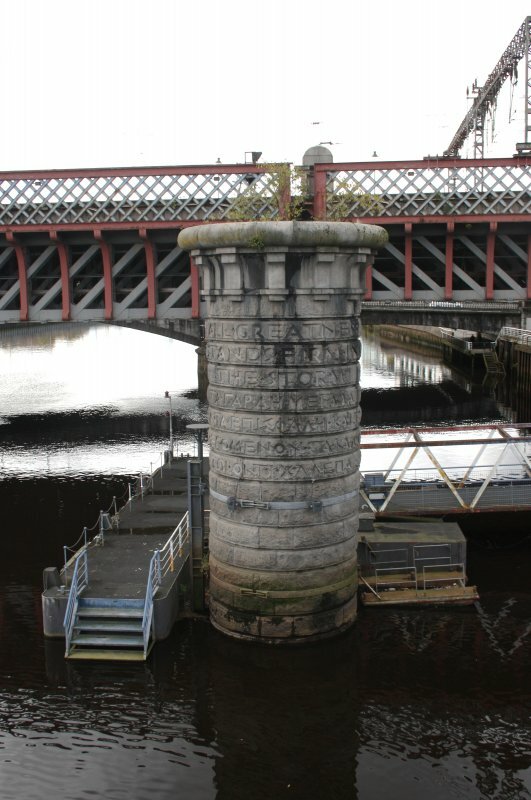 Of the first bridge, built in 1876-8 (engineer B H Blyth of Blyth and Cunningham of Edinburgh; contractor William Arrol and Co), contemporary with the first part of Central Station (NS56SE 77), only the piers remain just upstream [to the E] of the second and current bridge (NS56SE 140.01), the tracks and girders having been removed in 1966-7. 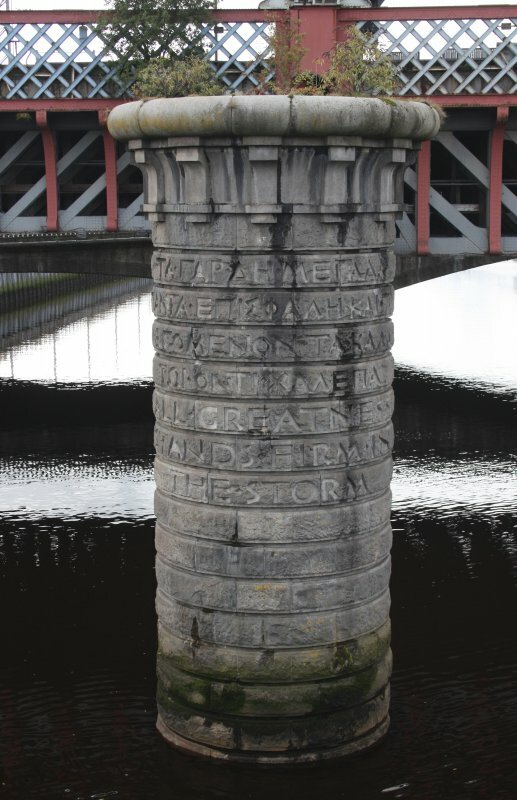 For each pier, two cast iron cylinders, 4.5m (15ft) diameter in the river and 4m (13ft)on the banks, were sunk to bedrock, filled with concrete and extended above the river-bed with masonry, the outside stones being of Dalbeattie granite. 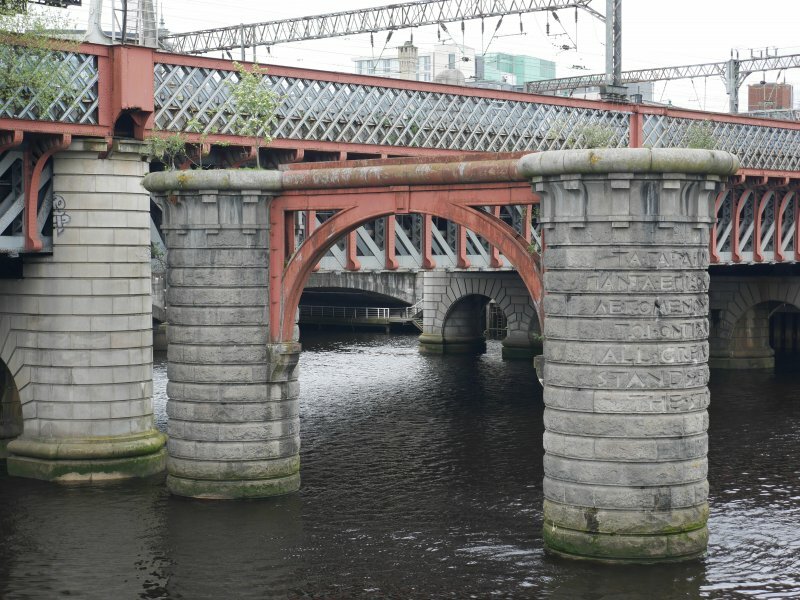 The two granite shafts of each pier rise high out of the water, and are still linked by arched cast iron frames placed there, by the engineer's admission, purely for ornament. 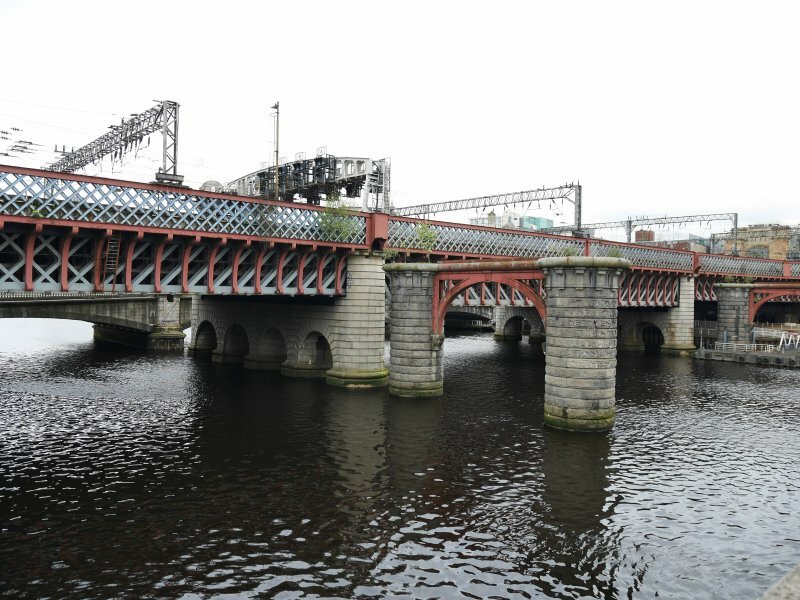 The earlier (E) of these two bridges was opened on 1 August 1879 to allow Caledonian Rly access to the (new) Central Station (NS56NE 77). 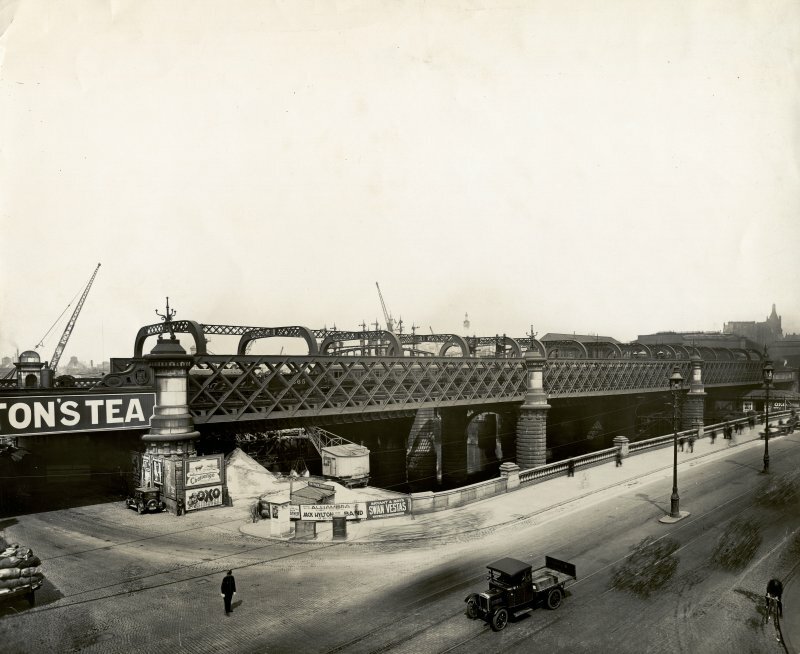 As part of the (1899-1905) expansion of Central Station a second bridge (of comparable appearance) was added on the W. The new bridge was brought into use in March 1905. At the same time, the old bridge was re-floored to bring it up to the height of the new. 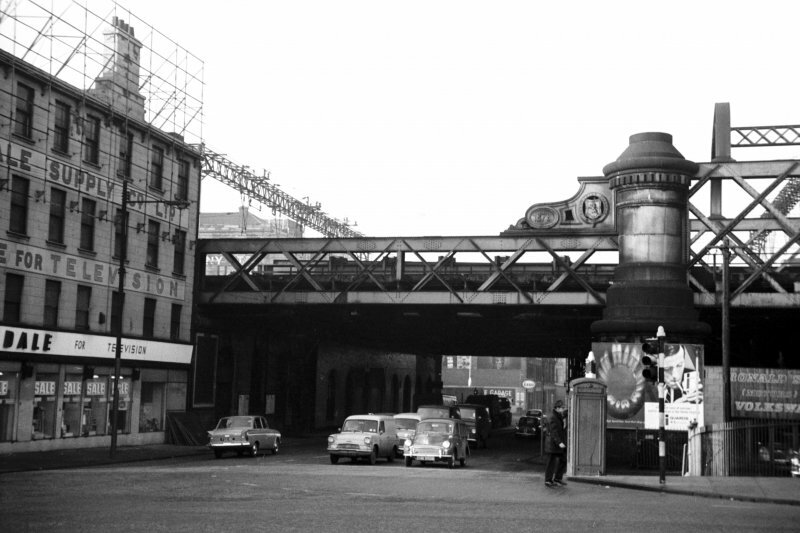 Re-signalling in 1960 and 1966 rendered it redundant, and it was demolished; the new bridge remains in use. 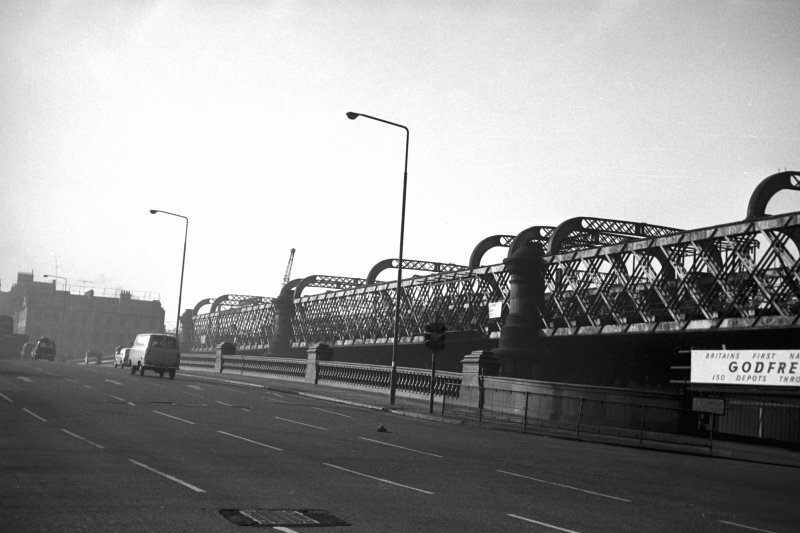 Although commonly termed a viaduct, this structure is more properly to be considered a bridge. 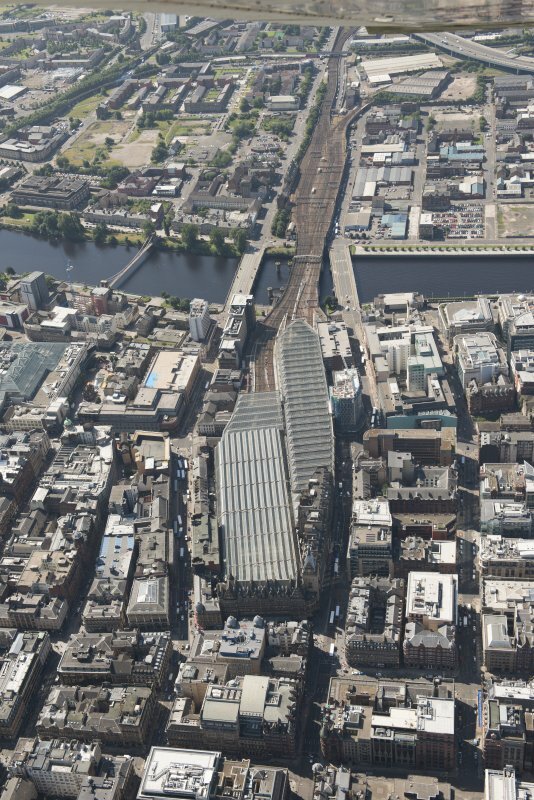 It formerly carried the original approach tracks of the Caledonian Rly main line across the River Clyde into Central Station (NS56NE 77), immediately to the N. It thus formed the most northerly portion of the West Coast Main Line (from London, Euston). 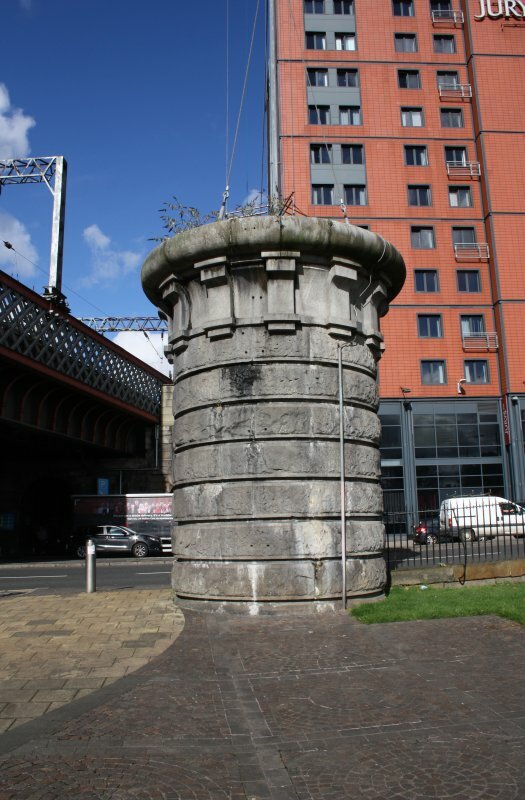 Its construction was a major event in the railway history of Glasgow, allowing the eventual closure of the former terminus (NS56SE 467) at Bridge Street Station (to the S of the river). The location assigned to this record defines the centre of the former span. The high approaches on each side render the extent of the structure unclear, but the available map evidence suggests that it extends from NS c. 58745 64905 to NS c. 59695 64695. 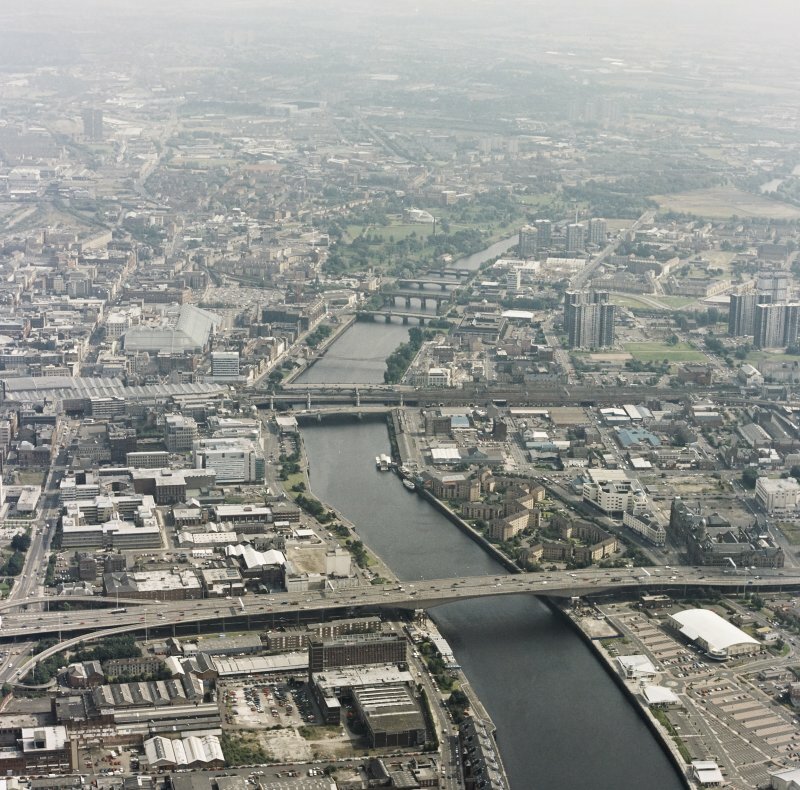 The river here forms the boundary between the parishes of Glasgoiw (to the N) and Govan (to the S). 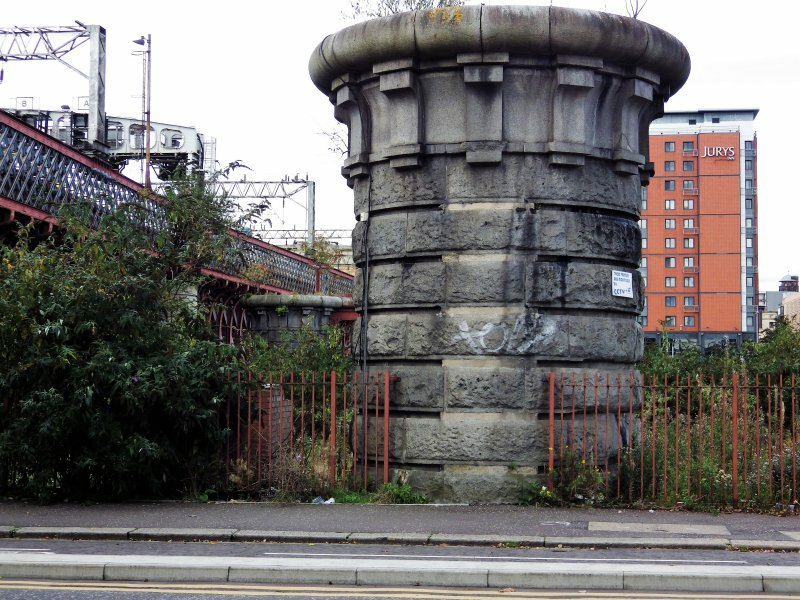 Pillar [NAT] (at NS 58709 64710: on land, on the N side of Clyde Place). ‘All Greatness Stands Firm in the Storm’ and the Greek section which translates loosely as ‘All great things are perilous, and it is true, as the proverb says, that beautiful things are hard [to attain]’. Visited by RCAHMS (AGCH, GLB) 14 May 2015. The freestanding southernmost pier (NS 58709 64715) on the east side of the remains of this bridge has been spray painted with graffiti on its south side.